Born and raised in Longview, Texas, Brandon Maxwell grew up enamored by the glamourous women that passed through the clothing boutique where his grandmother worked. The designer shifted focus back to his home state and headed to the desert town of Marfa, Texas (the art destination with a non-fuctional, installation Prada boutique) to design his spring collection. Eschewing overt references like cowboy boots and fringe jackets, the designer painted an honest picture of Texas power dressing (think 1980s oil-boom style in a Dallas country club) in bright red, pink, yellow, and aquamarine. The collection's stand-out accessories were translucent acrylic hat boxes and rectangular cases with gilded handles shaped like a horseshoe. The former carried bottles of rosé with custom Brandon Maxwell labels, while the latter held red, gray, and white iterations of cowboy hats made in collaboration with Florida-born, New York-based milliner Gigi Burris. Trimmed with cotton grosgrain ribbons, the hand-crafted styles were informed by hats Maxwell's grandmother owned. Maxwell's show was held at Manhattan's Classic Car Club, a membership-only organization located at Pier 76 along the Hudson River that provides access to exclusive vehicles from Ferraris and Aston Martins to iconic American muscle cars. Kia Motors, a partner on the designer's show this season, made a substantialdonation to Marfa's underfunded school system and provided teachers in the town with its latest car the Telluride. The new mode of transportation will allow them to commute to Austin and Dallas for continual professional training. 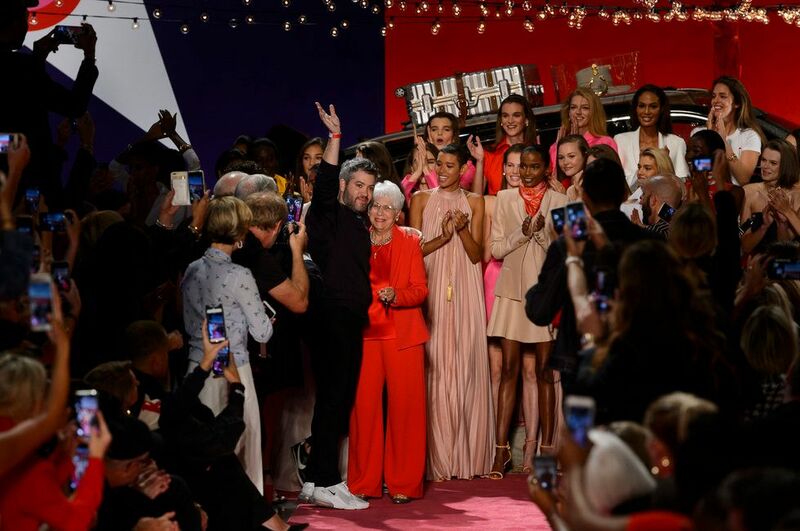 At the end of his show, Maxwell walked onto the magenta carpet runway with his mother Pam Wooley. Shortly after, the designer's entire team came out from backstage as guests and models cheered loudly, smiling from ear to ear. The heart-warming scene was only made warmer by a kiss and embrace between Maxwell and his husband.